Medline ReadyBath shampoo caps allow users wash their hair without using water, having a rinse free shampoo and condition in just one step. Waterless shampoo and conditioner in one easy to use shower cap. 1.) If heated, check temperature prior to application. 2.) Place the cap on the head. Longer hair requires the user to to bundle the hair on top of head prior to shampoo cap placement. 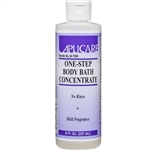 Medline ReadyBath Shampoo and Conditioning Caps is one of our most popular products. The Medline ReadyBath Shampoo cap is a shower cap that has a special shampoo and conditioner built in and requires no rinsing. The ReadyBath shampoo cap is a great option for people who are recovering from an injury or illness, the elderly, bed bound individuals, truck drivers or campers. The Medline ReadyBath shampoo cap can be heated up in the microwave for 15-30 seconds (times may vary) for a soothing warm shampoo. ReadyBath shampoo caps are used in nursing homes and hospitals.